Cable TV has proven to be more problematic than ever before and people are ditching it for media streaming devices. People are desperately looking for options and the only viable option is the media streaming boxes. They provide a lot of content and they provide this with HD quality and good high-quality sound as well. Cable TV is expensive for nothing and no one wants to spend a lot exclusively on TV entertainment. There are many companies today making the media streaming boxes and they include Google, Apple, Amazon,and Roku. All these deliver similar services but in a much different way. In this article, we are going to look at Roku Express, Roku Express Plus,and the Chromecast Ultra HD. These devices have many differences than similarities. Roku has adapted Ford’s color design (it can be any color so long as it is black) and stuck to it. 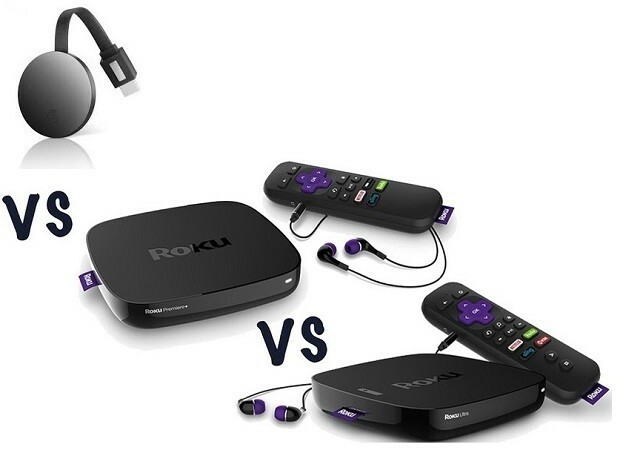 Roku Express is not so different in design as compared to the Express Plus. The only notable difference is the audio output port that allows you to connect to your older TV. The Express plus has this port that was missing in the Roku Express and the device also comes with the AV cable that allows you to do the connection to the TV. The cable has three connections on one side, yellow, red and white and if you take a look at your TV it has the ports at the back with the same colors. With Chromecast things are a bit different since it doesn’t have the cable just like the Express and its design comes in the form of a dongle while the Roku comes in a box-like design. Chromecast Ultra HD did not stick to one color and is available in different colors. The small packages of these three boxes pack pretty smart technology. The Roku Express and Google Chromecast both have the capabilities of streaming 1080p on the HD TVs. When it comes to audio, Roku Express has Dolby Audio pass while the Chromecast supports Dolby Digital Plus. The Roku Express plus on the other hand has the same video output but the audio capacity is not the same as the Express. With the Roku Express plus, there is a sticky tape that comes with the box where you are supposed to tape it to your TV and make sure you maintain a line of sight for the remote control to work perfectly. This is different from the Roku Express which doesn’t require a line of sight with the box for the remote to work. It is also different with the Chromecast Ultra HD which is left hanging at the back of your TV. The Chromecast Ultra here might be the simplest to control but that might be because of the remote limitation of the device. To control it, you just need a mobile device, tablet or computer where you install the Cast app used to control the device. Chromecast doesn’t come with the standard remote control. The Roku Express comes with a standard remote control that is easy to use. The device can also be controlled using the Roku Mobile app. This means it is at par with the Chromecast but surpasses it using the remote control. The Roku Express plus comes with a functional, simple and easy to use remote control. The remote control has several buttons with some dedicated to open specific streaming apps like Vudu and Netflix. Here, all the three devices are at par but the Chromecast might be better than the Roku Express and the Express Plus. All of the devices offer access to a broad range of content starting with Google which offers over 200000 TV shows and films, radio, sport, 30 million songs, games and more. The Roku Express and the Express Plus, on the other hand, boasts of over 350000 with content from some of the biggest providers like Netflix, Amazon Instant Video, Sling, HBO Go, Hulu Plus, Lifetime, Google Play Movies, History and many more. Remember the remote control comes with the shortcut buttons to open some of these apps straight without having to browse through the user interface. One thing worth noting is that owning the Google Chromecast Ultra HD gives you access to special Chromecast offers which change regularly. These include free trials of Google Play Music, NOW TV and Disney Life. This is a question best answered by you the end consumer but you can buy any of these devices and if you don’t like them you can return to the shop and get another one. However, it is good to know if you have the older TV, the Roku Express Plus is the way to go and if you are the kind that enjoys control primarily using your mobile device, then the Chromecast Ultra HD is the way to go.